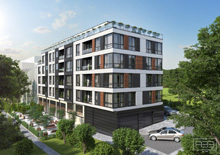 “Buy in Bulgaria” is offering spacious and cozy one bedroom apartment, located in Galata, Varna. The apartment boasts beautiful views towards the sea and Varna itself. It is suitable for living all year, as well as to let it in the summer, mainly due to the great view and the close proximity to very nice, sandy beaches. The property is situated on the third floor of five total and has an area of 65 sq.m. The following premises are available: living room with kitchenette (26 sq.m), bedroom (18 sq.m), panoramic terrace (5,5, sq.m), bathroom (4,5 sq.m) and a passage way (4,3 sq.m).